With the Rio Olympic Games starting in just a few weeks, and today being one of the most important but little known national holidays, I thought to myself, what better way to take notice than with an advertisement released recently that celebrates both? What national holiday takes place today may you ask? NATIONAL JUNK FOOD DAY OF COURSE! Before I get into all of our bad junk food habits, I’d like to spotlight Coca Cola’s new campaign, #ThatsGold, by Ogilvy & Mathers Brazil and David. Coke counts as junk food, right?? The goal of Coca-Cola’s campaign for the 2016 summer games was to capture the joy and excitement of winning Olympic gold medals and how it is comparable to some of the emotional highs in real life. The campaign will consist of TV and print ads featuring 79 Olympic athletes from 23 countries. What are your thoughts? I personally think they achieved their goal because we can all relate to a crowning moment. A moment where we have felt like a gold medalist, no matter how small or large the feat was. Back to National Junk Food Day. The other day Tara mentioned that we should start a segment on our blog featuring odd national holidays. Coincidently, National Junk Food Day was the next one. Of course none of us could pass up the opportunity to cheat on our diets, so I took it upon myself to ask everyone at the office what their favorite junk food was. What are some of our favorite junk foods may you ask? Donny: “I was researching junk foods and found the following article: This Man Ate Only Junk Food for 30 Days and Lost 11 Pounds. It’s real and interesting. We couldn’t stop at just talking about our favorites, so we went ahead and threw our own National Junk Food Day soirée featuring all of our favorite guilty pleasures. Even though all of our stomachs are bursting at the seams and I can barely keep my eyes open while typing this, I think I can say our first annual National Junk Food Day party was a success! 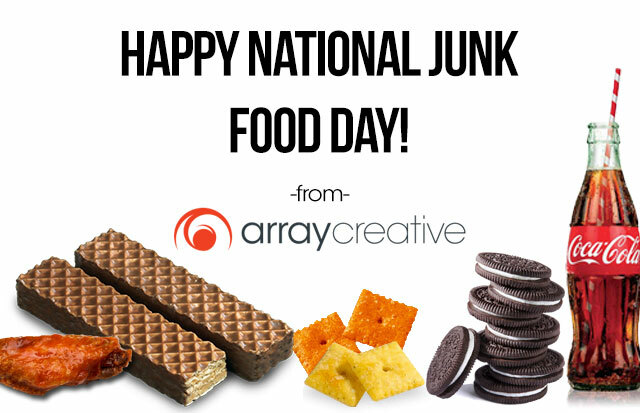 Feel free to comment below and let us know what your favorite junk foods are! Birkner, Christine. “Coca-Cola Celebrates Gold Medal Moments in Campaign for Rio Olympics.” AdWeek. N.p., 13 July 2016. Web. 21 July 2016. <http://www.adweek.com/news/advertising-branding/coca-cola-celebrates-gold-medal-moments-campaign-rio-olympics-172485>. Cocacola. “Gold Actions.” YouTube. YouTube, 14 July 2016. Web. 21 July 2016. <https://www.youtube.com/watch?v=-xgrFv-j1ws&ab_channel=Coca-Cola>.